You are here: Home / Chapter 7 Bankruptcy / What A Difference A Bankruptcy Chapter Makes: What A Relief! What A Difference A Bankruptcy Chapter Makes: What A Relief! Most people are aware that there are two common chapters of bankruptcy for individuals and families. The two chapters are chapter 7 and Chapter 13 of the United States Bankruptcy Code. Nearly 75% of all bankruptcy cases are of the chapter 7 variety. Chapter 7 provides for a fresh start for someone who has very little in the way of assets. However, there are exceptions to the fresh start under Chapter 7. These exceptions include student loans, recent taxes, parking tickets, child support, maintenance, and debts incurred by fraud. The remaining 25% or so of bankruptcy cases are of the chapter 13 variety. Chapter 13 allows for the reorganization of debt over a 3 to 5 year period based upon the debtor’s assets, liabilities, income and expenses. There are advantages to each chapter depending upon the debtor’s particular fact situation. I want to highlight the difference between chapter 7 and chapter 13 as it relates to one particular type of debt. I’m referring to parking tickets owed to the City of Chicago. The city has become very aggressive in its effort to increase revenue. They have gone out of their way to target minority communities and others, especially during tax refund season, by applying pressure on those with parking tickets due and owing. The city has the ability to place a boot on the debtor’s vehicle, impound the vehicle if the debt is not paid within 24 hours thereafter and then charge storage fees on top of the tickets and the tow charges. Debtors do not like to see their vehicles booted, towed and impounded. After all, people need to get to work, shop, provide for their families and basically get around the city. Luckily for these debtors who are burdened by parking tickets, the bankruptcy code provides for an incredible way of dealing with said tickets. As I mentioned earlier, chapter 7, the fresh start bankruptcy will not eliminate parking tickets whatsoever. However, chapter 13 will allow for a reorganization of those parking tickets by paying as little as 10% of the total debt owed. 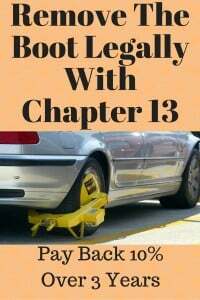 So by choosing the proper chapter, in this case chapter 13 to deal with parking ticket debt, the debtor will recover the vehicle provided he continues to make monthly payments to a Chapter 13 trustee over the next 3 to 5 years. In addition to the parking ticket debt, the debtor can reorganize other debt such as an auto payment, mortgage deficiency, credit cards, medical bills, personal loans, past-due utilities, and just about any other debt that he may have. By way of example, I met with a debtor last week who owed the City of Chicago $8000 in unpaid parking tickets. His vehicle was booted, towed and was sitting in the Chicago pound awaiting payment. This debtor had no other debt other than the City of Chicago parking tickets. However, he did not have $8000 at the ready to turn over to the City of Chicago in exchange for his vehicle. Thus, I proposed a chapter 13 solution which would pay the city back in monthly installments over an extended period of time. Instead of paying back $8000 to the City of Chicago, the debtor would effectively pay $800 over a three-year period. When I factored in the attorney’s fees, court costs, and trustee’s fees, he was looking at a monthly payment of $135 for 36 months. Not only was this payment plan something that he could afford, but he would prevent the City of Chicago from being able to boot or tow or impound his vehicle in the future provided he continued to make the payment plan and provided he did not incur any new parking tickets post-bankruptcy filing. He was amazed that this type of relief was available under Chapter 13. He had been to another lawyer who told him that he would have to pay back the entire $8000 over a 3 to 5 year period. Obviously, that attorney was not aware of the ability to pay less than what is owed in a chapter 13 bankruptcy case even if the debt is for parking tickets which would be nondischargeable in a chapter 7. As you can see, there are different forms of relief based upon the facts of the case. If you or someone you know is struggling with parking tickets owed to the City of Chicago or any other municipality, you may be helped under Chapter 13 bankruptcy laws. You can contact my office directly at 847-520-8100. My office will provide a free, initial consultation to let you know what you could be looking at under either chapter 7 or Chapter 13. If bankruptcy does not make sense for you, we will tell you straight up to not file. On the other hand, if bankruptcy makes good sense for you, we will lay out the guidelines, provide the framework, and help you every step of the way to get you the relief that you need.